The large repeated strain in the conjugated polymer film during actuation leads it to delaminate from the underlying Au electrode, as shown in the figure. (This occurs first at corners and edges.) To improve the adhesion, the surface can be roughened so that the two materials mechanically interlock. Both by both electroplating and etching is effective. Surface functionalization with thiol self-assembled monolayers (SAMs) has also been tried, but such monolayers are unstable to electrochemical cycling. 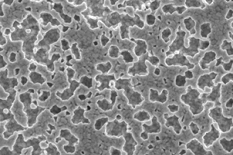 A layer of Au electroplated to a thickness of 1 µm electroplated under the right conditions to create a rough layer prevents delamination of 0.3 µm thick PPy films. Unfortunately, this is too thick of an Au layer for our microactuators. M. Pyo, C. C. Bohn, E. Smela, J. R. Reynolds, and A. B. Brennan, "Direct strain measurement of polypyrrole actuators controlled by the polymer/gold interface,"
Chem. Mater., 15 (4), 916-922 (2003). 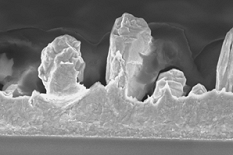 Y. Liu, Q. Gan, S. Baig, and E. Smela, "Improving PPy adhesion by surface roughening,"
J. Phys. Chem. C, 111 (30), 11329-11338 (2007). Roughening the surface by etching the Au is also effective, and more appropriate for microactuators. However, the desired surface structure, shown here, depends on the grain boundaries, and thus may be difficult to reproduce. Further work is needed on this. Y. Liu, Q. Gan, S. Baig, and E. Smela, "Improving PPy adhesion by surface roughening," J. Phys. Chem. C, 111 (30), 11329-11338 (2007). Figure is from "Improving PPy adhesion by surface roughening,"
Y. Liu, Q. Gan, S. Baig, and E. Smela, J. Phys. Chem. C, 111 (30), 11329-11338 (2007). Self-assembled monolayers can be used to functionalize the surface (i.e. attach moieties with desired characteristics). Molecules with thiol groups (-SH) will spontaneously adsorb onto Au, releasing the H and forming a bond that is stronger than a hydrogen bond, but weaker than a covalent bond. 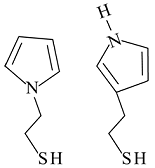 1-(2-thioethyl)-pyrrole (left) and 3-(2-thioethyl)-pyrrole (right) were synthesized and characterized for this purpose, the idea being that the thiols would anchor the molecules to the Au while the pyrrole head groups would be incorporated into the PPy film during electrodeposition, thus improving adhesion. Unfortunately, neither of these molecules was stable to electrochemical cycling, so this approach is not effective. E. Smela, G. Zuccarello, H. Kariis, and B. Liedberg, "Thiol Modified Pyrrole Monomers: 1. Synthesis, Characterization, and Polymerization of 1-(2-Thioethyl)-Pyrrole and 3-(2-Thioethyl)-Pyrrole," Langmuir, 14 (11), 2970-2975 (1998). E. Smela, H. Kariis, Z. Yang, K. Uvdal, G. Zuccarello, and B. Liedberg, "Thiol Modified Pyrrole Monomers: 2. As-Deposited Monolayers of 1-(2-Thioethyl)-Pyrrole and 3-(2-Thioethyl)-Pyrrole," Langmuir, 14 (11), 2976-2983 (1998). E. Smela, H. Kariis, Z. Yang, M. Mecklenburg, and B. Liedberg, "Thiol Modified Pyrrole Monomers: 3. Electrochemistry of 1-(2-Thioethyl)-Pyrrole and 3-(2-Thioethyl)-Pyrrole Monolayers in Propylene Carbonate," Langmuir, 14 (11), 2984-2995 (1998). E. Smela, "Thiol Modified Pyrrole Monomers: 4. Electrochemical Deposition of Polypyrrole over 1-(2-Thioethyl)-Pyrrole Monolayers," Langmuir, 14 (11), 2996-3002 (1998).